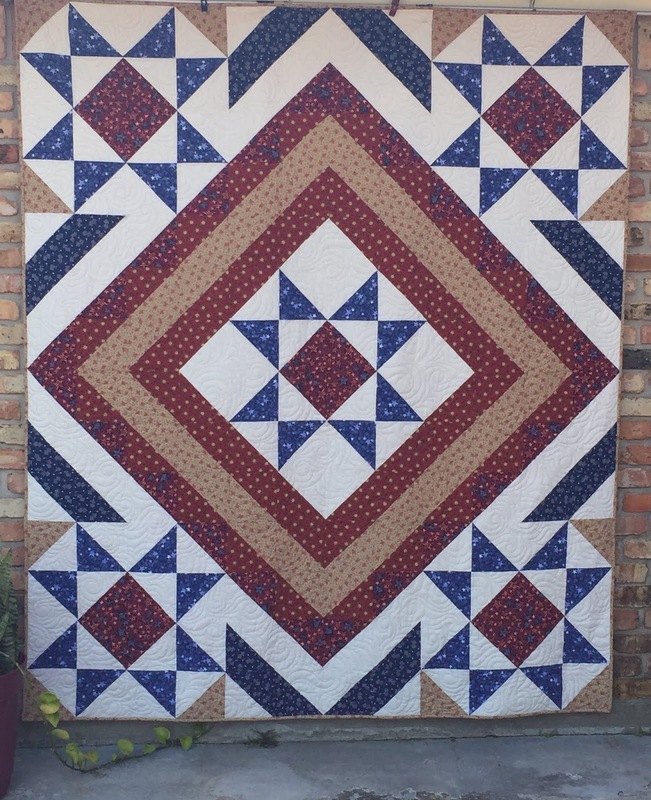 Back in 2011, I designed "Stars Over Scott" as a way to use up Half Square Triangles -- there are 168 HSTs in this top, nothing else. The Top comes together easily and when a call comes in for an Emergency Quilt of Valor, it is a great "Go-To" pattern. Every so often, I will search Google, or Pinterest and find a new "Stars Over Scott" someone else has made. It doesn't matter what size HST you use, the results are always the same. The above version is without a border .... however below is one I made in 2013, with borders because I used smaller HSTs. (Donated for Breast Cancer Awareness). Linking up with Sarah, Confessions of a Fabric Addict. Both quilts are stunning. I am not sure which one I like the best. 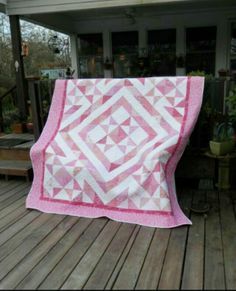 Oh these are gorgeous quilts, a great pattern! That's a great pattern! I made one in pink, very similar to yours, for my granddaughter. Also made one in black and white with a red center and one in blue and tan from leftover HSTs. At a quilt retreat, I had my sister and a few of her friends make the 168 HSTs before and used this as a mystery quilt. We had one in orange and white, a blue and white and a red and white. I don't think they liked making the 168 HSTs but their quilts were gorgeous. Love this pattern! Wow! What a beautiful quilt! It's a wonderful pattern, and I think I'm going to use it for American Hero Quilts, too. I also like it in the softer colors, so it would make a great quilt for anyone.